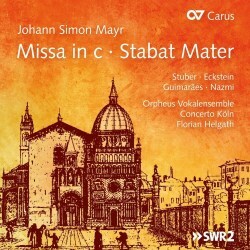 In recent years several recordings of music by Johann Simon Mayr have been released, in particular on the Naxos label. The man responsible for most of them is Franz Hauk, who also wrote the liner-notes to the present disc. Mayr has become best known for his operas which are the link between the 18th-century opera seria and the melodramma of the 19th century. However, his historical importance is hardly reflected by performance practice in our time. Apart from the recordings under Hauk's direction little of Mayr's output has found its way onto disc and his operas are seldom performed in the music theatre. As his name indicates Mayr was German by birth; he was born in Mendorf, near Ingolstadt, in Bavaria. He received his first lessons from his father, a schoolteacher and organist. He was a child prodigy as a singer and player of the keyboard; before his tenth birthday he already started to compose. In 1781 he began to study theology and law at the university of Ingolstadt. In 1786 he published his first compositions, a collection of songs. Through connections, he was able to go to Italy. Here he studied in Bergamo, but it was especially a stay in Venice which had a lasting influence on his development as a composer. There he became a pupil of Ferdinando Bertoni, maestro di cappella of St Mark’s, who was a prolific composer of operas and sacred music. Mayr also had the opportunity to listen to what was performed in the theatres of Venice. Throughout his career Mayr kept a close relationship to Venice. Many of his operas were performed there, as well as in other north Italian cities. However, for most of his career he worked in Bergamo, where he played a key role in music life. He founded a music school; he became its director and professor of music theory and composition. One of his students was Gaetano Donizetti. Mayr's oeuvre is huge. The work-list in New Grove includes more than 60 operas, twelve oratorios, a considerable number of cantatas and a large corpus of sacred works, including eighteen masses, 277 mass movements and seven Requiems. The present disc offers two specimens of his sacred oeuvre. The Stabat mater dates from around 1803. Mayr seems to have composed four versions of this text, but three of them have been preserved in bits and pieces; the present setting is the only which has come down to us in a complete version, authorised by the composer. The text is divided into eight sections. The first (‘Stabat mater’), the third (‘Quis est homo’) and the last (‘Quando corpus – Amen’) are for choir, the other sections for a solo voice; in addition to the arias there is one duet for soprano and tenor. The solo sections show the influence of opera, something which can hardly surprise considering Mayr's activities in that field. However, he is more restrained than other opera composers, and certainly than composers of later generations, such as Rossini. In fact, there is quite a lot of text expression here. The tenor aria ‘O quam tristis’ and the soprano solo ‘Eja mate’r are good examples. The latter includes an obbligato part for violin. The four soloists deliver outstanding performances here; only Marion Eckstein uses a little too much vibrato. In the duet ‘Virgo virginum’ Katja Stuber and Fernando Guimarães are a perfect match. The Missa in c minor is of a much later date: it was written in 1825 and was the result of a commission from Joseph Morel of the convent of Einsiedeln. The autograph of this Mass is preserved in the music library of the convent. It was first performed on 28 May 1826 during the first Holy Mass that was celebrated by Morel’s younger brother Father Gall Morel. The latter was prefect and rector of the school, librarian and between 1835 and 1840 Kapellmeister. It was performed again twice in September of both 1826 and 1829, as part of the Engelweihe, the anniversary of the dedication of the Chapel of Mercy that was celebrated with particular ceremony in Einsiedeln. It is not an entirely original work. For the ‘Kyrie’ Mayr turned to an earlier setting of the same text from 1812. For the ‘Credo’ he used a setting of 1824 by his pupil Donizetti; one section of the ‘Et incarnatus est’ was added by Mayr himself. Franz Hauk also refers to several influences from Beethoven: in the opening of the ‘Kyrie’ Mayr quotes the piano trio Op. 1 No. 3 and at the start of the ‘Gloria’ he refers to a motif from the opening movement of Beethoven's 4th symphony. The Mass is different from the Stabat mater, both with regard to the role of the orchestra and the connection between solo and tutti sections. The former aspect ranks this mass among the ‘symphonic masses’ which were written by the likes of Haydn, Hummel and Beethoven. The orchestra plays a major part in this kind of mass and its role goes well beyond that of merely accompanying the soloists and the choir. The score includes a number of obbligato parts: a violin in ‘Et incarnatus est’- the expressive highlight of this Mass - and a clarinet in the ‘Agnus Dei’. The instrumental scoring of the ‘Qui tollis peccata mundi’ is also notable: in various episodes the singers are supported by two flutes and a bassoon, with the strings playing pizzicato. In contrast to the Stabat mater the Mass is not divided into separate sections for soli or tutti. In most sections episodes for solo voices and for choir alternate; the solo episodes are mostly fully integrated into the musical fabric. In most sections the soloists act together; passages for a single voice appear only in the ‘Sanctus’ (soprano) and the ‘Dona nobis pacem’ (bass). Because of that, the blending of the voices is very important, and in this regard the four singers do an excellent job. They have adapted their voices and their ways of singing to each other in such a way that the episodes for solo voices show much cohesion; they truly perform as an ensemble. Florian Helgath has managed to create a perfect balance between soli and tutti; the soloists are an integral part of the performing apparatus. This is probably the first recording of Mayr’s music on period instruments. It is rather odd that up till now the representatives of historical performance practice have almost completely ignored Mayr. These two pieces demonstrate that this is a serious mistake. I have greatly enjoyed these works which raise my interest in more compositions from Mayr’s pen. It is to be hoped that a disc like this will encourage performers to turn to Mayr's large oeuvre. These performances are certainly a strong case for this more or less forgotten master.